Churchill, as a former First Lord of the Admiralty, was well versed in the importance of Britain protecting itself at sea. 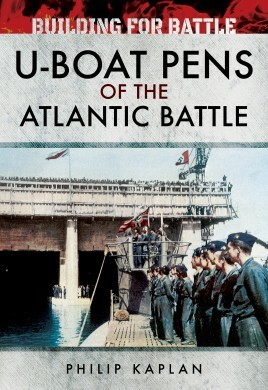 In the opening years of the Second World War, Germany’s U-boat (submarine) fleet was tasked with attacking and destroying the supply ships that Britain depended upon for its survival. In this new publication from Philip Kaplan, the massive bunkers or ‘pens’ constructed in Brittany by the laborers of the German Organisation Todt are revisited. These giant structures, some of which sheltered more than a dozen submarines at a time, still exist because they were built with concrete ceilings more than three meters thick. With equally impressive supporting walls, they suffered relatively little damage in the wartime bombing raids of the Royal Air Force and the US Eighth Army Air Force. Illustrated with more than 150 rare and compelling photo images, this book is a richly rewarding journey back across time to some of the most intriguing and electrifying sites from the war years. The story of the pen shelters and their part in that war is both fascinating and enduring.